Monday Motivation — What’s next? New Year’s Eve brings with it the excitement of possibility—the possibility and the promise of every one of the 365 days in the coming new year. What will the days bring? What will you do with each day? Will you do the same things you’ve always done—eat the same food, go to the same places, do the same things? Or, will you try something new, something fresh, something different? Will you take a chance this year—on love, with a project, for a friend? Will you risk being wrong, humiliated, embarrassed, or failing? What will you do with the New Year? It’s a wrapped gift that only you get to imagine what’s inside. The New Year is yours to create. No limits. No fear. 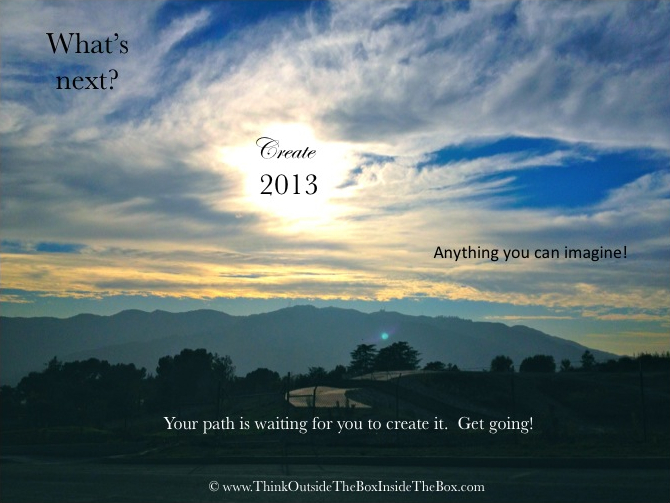 Your New Year is waiting to be created. Get going!